Flush mounted ceiling lights are a blend of hassle-free performance, compact form, and easy installation. Also, design & shape options seem endless in this niche. We have created a wholesome portfolio of simple and intricately designed flush mounted ceiling lights. You can choose the traditional or more contemporary designs. From differently elevated and shaped ceilings to workplace decors, we have a flush ceiling light for every requirement. For soothing, cozy lighting in the dining room to bright illumination in the reading room, our online collection of flush mounted ceiling lights is incomparable. Come & explore a stunning variety of flush lights in attractive designs, ranging from the ever-popular pendant chrome fixture to the classical favorite, parlor flush mount lights. Please contact us for special discounts / pricing on bigger orders. 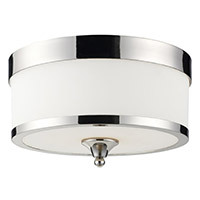 Flush Mount Ceiling Lights There are 2909 products.